Garage Clean Outs & Removal Services | 1800-GOT-JUNK? A garage is meant to be a place to park your car and keep it sheltered from the weather. In many cases, that’s not what the garage ends up being used for. Instead, they end up being used mainly for storage, with piles of rubbish everywhere. However, when it comes down to actually cleaning out the garage on your own, it seems like a pretty daunting task. Thankfully, you don’t have to handle it on your own. 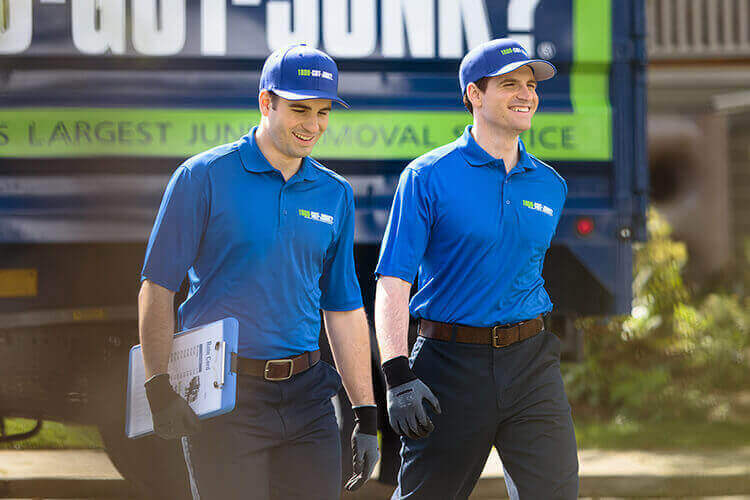 At 1800-GOT-JUNK?, we’re garage cleanout experts and we’re happy to help! Whether it’s a couple of larger items or a whole garage full of stuff, we’ll get your garage cleaned out in no time. We make garage rubbish removal easy. It starts with our easy booking process—just give us a call or visit us online and choose a time that is convenient for you. On the day of your appointment, we’ll give you a call before we arrive to let you know when to expect us. Once we arrive, we’ll take a look at your unwanted items and give you an estimate. If you’re happy with the price, we’ll get to work! We take care of everything—all you have to do is point. We’ll even sweep up the area when we’re done. Just like that, you’ll have a clean garage!